We posted some hands-on thoughts about the Mega Man 9 E3 demo from GoNintendo and Wii Fanboy yesterday so we could find out if it lived up to the expectations. I'll reign in my nostalgic enthusiasm for the game now to conclude and say that Mega Man 9 is getting it right. 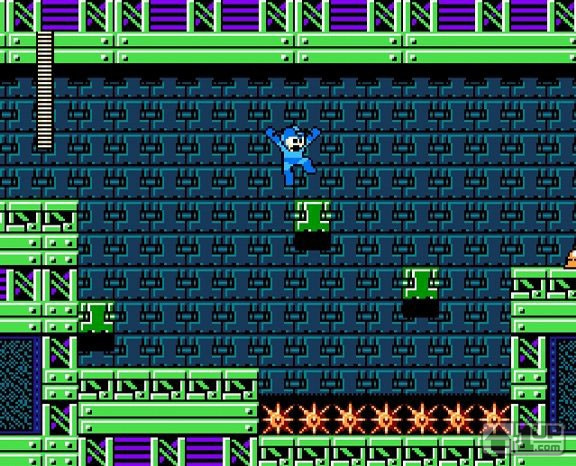 It's a little bit off and doesn't feel quite like a perfect companion to the original NES Mega Man games, thanks to its mish-mashed approach of presenting a grab bag of different elements from each of them. But even still, after over a decade and a half since the release of the last game made in this style, it's an incredibly enjoyable and valiant return to form. Capcom is taking a bold step by sticking to the 8-bit formula of the early games, and the simple graphics, catchy music, and classic gameplay are well done and don't feel forced. The game looks and feels like the Mega Man you loved as a kid. Mega Man 9 is confirmed as a WiiWare game and is currently scheduled for a fall release. It's this mix of the familiar and the new that makes MM9 so intriguing. Capcom's burden with the game is to prove that this play style, so thoroughly mined and exhausted back when the NES was a viable platform, can still entertain and surprise two decades later. So far, they look to be pulling it off. Long-time fans will recognize plenty of old, familiar enemies: The low, spiked platform defenders from Elec Man's stage in the original Mega Man, which can only be stunned, not destroyed; the pipes from Crash Man's stage which dispense an infinite array of slow but dangerous cylinder-type foes; those damnable disappearing blocks. People are going to eat Mega Man 9 up simply because there are definitely more lovers than haters. We need more platformers, and it's just the right time for a game like this. It plays the nostalgia card, sure, but it's also just a great game. The newest concept isn't by default the best concept. Old ideas can be fun…otherwise we wouldn't be excited for the ninth installment of a franchise that has fundamentally changed none since 1987. All in all there were some pretty positive commends. Only really IGN had any concerns that this might not live up to expectations. So far, so good. Now where's Eurogamer's preview? Yes, I'm loving everything except the dissappearing blocks. Those things are so G-D damn annoying! I never beat Mega Man 1 because of those things! Plus they're over spikes of all things! This is indead the hardest Mega Man game ever. Edit: Did I forget to say, "Thank You"? Thanks for posting all of this info up =). When they say, that they sticked to the 8-bit formula of the classic games, they also mean that they sticked to the hard as bone level of difficulty? Although I do not know Mega Man, I can remember a game called "Ghosts'n Goblins" which also was from Capcom. At that time, 1986, I have played it over and over on the C64 and loved it very much. But when I play it today remains for me no other choice than to sit there and watch one Game Over after another. Apparently the reflexes aren't getting better when we get older. I assume that Mega Man 9 has at least a similar difficulty as Ghosts'n Goblins. Mega Man 2 feel with a Mega Man 1 difficulty curve? Hell... freaking... yes. I'm chomping at the bit for this to hit WiiWare! I hate when that ignorant moron says that first stage is hard man's. Hard man was in Mega man 3 you Idiot! You'd think he should have some sorta clue about the game he's telling people about. He also said there would be no next Gen content. I guess Online leaderboards doesn't count. Oh something else I noticed. He claims there is no slide ability but if not how are you supposed to get that bolt in first area shown on the video? i can tell you right now that Dr. Wily will be framing Dr. Light. Predictable stuff but then thats retro Megaman storylines for you. Why you are so angry? He is a human being and as human beings we sometimes make mistakes (especially in places filled with people and pressure). Anyways, it could be so that the sliding ability is gained at some point but it won't be there from the start or then it could be so that there isn't that ability at all but with a certain weapon it would be possible to get items from places like on that video. Everything is possible. You could've said your point without any unnecessary name-calling. Hm. Could this have a meaning? If this does well, I wonder if there will be other 8 and 16-bit originals to classic games, or original ips. They say the game seems harder than the old Mega Man games, but probably due to aging reflexes. Nobody's complaining about the difficulty, either... They're praising it. Ghouls 'n' Ghosts, to my recollection, was far, far harder than Mega Man. It's great how in the opening cutscene, Dr. Light tells Mega Man "Be Careful! You haven't done this in a while!". That's a great allusion of Capcom to there not being any games for a while. All that background noise in the first video got on my nerves, But the new footage is awesome! I'm disappointed though that Mega Man loses his newer abilities. @Mickeymac. I know what you mean by those disappeering platforms. I'll probably break a controller or two from those things =P. @Tidesofchaos. Yes, very clever allusion. @Peznaze: Yes, you are right. No one complains about the difficulty in Mega Man. Actually, nobody complains about anything. If you say that it is by far not as difficult as Ghouls'n Ghosts then it is perhaps not as hard as I suspect. I think Ghouls'n Ghosts is even easier than Ghosts'n Goblins. 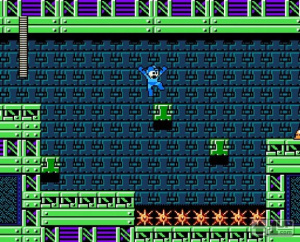 17th December 1987 - is that when Megaman 1 was first sold in America? Megaman is hard by todays standards, but no it's nowhere near as hard as Ghouls and Ghosts. That game is frustrating at times, Megaman isn't. I'll definately be buying this. Show your support folks, even if your not a Megaman fan. We wan't more retro remakes, and that's the way to get 'em!